Available on Guero and 3 other releases. "Ghost Range" is another remix of "E-Pro." This one was done by the group, Homelife. It's a more cluttered remix of the song, with all sorts of effects, Asian-sounding stringed instruments, synthesizer gurgles, a cool cello/viola break, and then some nasty bass playing the guitar riff of the original. 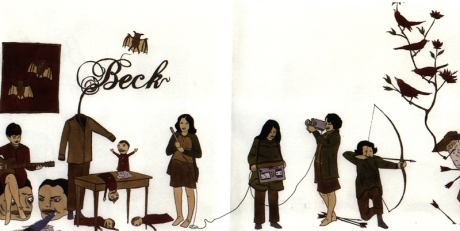 Homelife, as you can tell, decided to add their own music, with the idea of this being as close as they could to getting to collaborate with Beck. They replayed a few riffs, added some of their own, and tried to stay away from the "computer world" sound. It is this naturalness which makes "Ghost Range" one of my favorite remixes. This remix is on the UK "E-Pro" single, as well as available for purchase on iTunes. It is also the "E-Pro" remix on Guerolito. Here is their myspace page. Like most of the remixers on Guerolito, apparently Homelife had no contact with Beck in setting up their remix. Beck apparently had heard something of Homelife's he liked (they don't know what), and had his management contact them. Homelife even considered getting a Welsh singer to sing on "Ghost Range," but did not get that far with the idea.